BEDS: A remarkable find – two craftsman-made, matching, antique, wooden beds, now painted a soft gray. Each bed has a lovely selection of handmade bedclothes: a white mattress, vintage handkerchief fine cotton sheet, striped eiderdown and flowery bedspread, plus one covered pillow and one bolster. 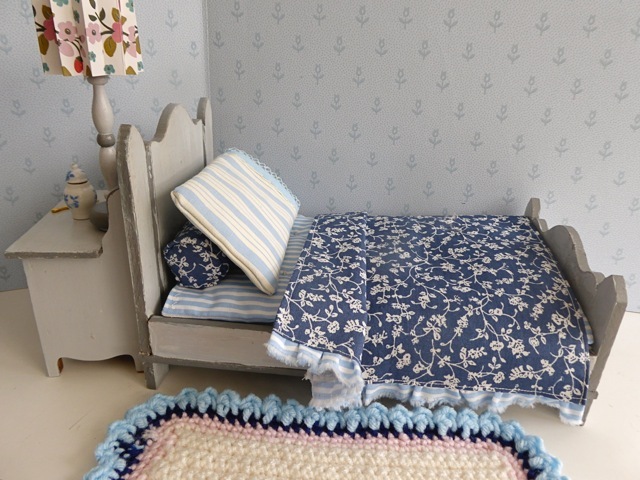 Note that all of our bedding is created from vintage cottons, and can be hand-washed (please see the close-up photo of the bed to see the charming details of the bedclothes). In addition, there’s one teddy bear and one wooden dolly. 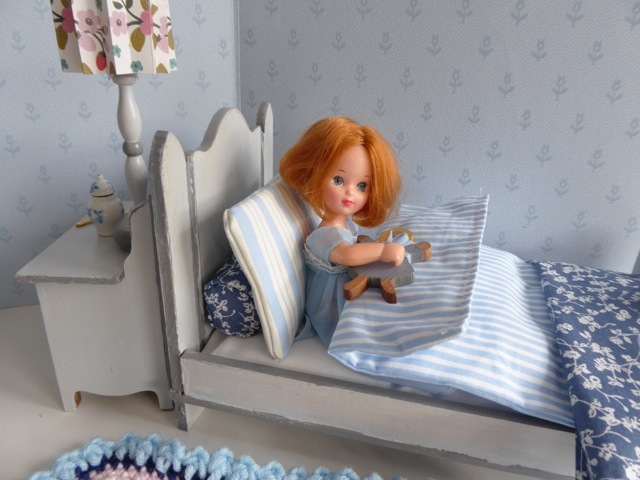 Each bed measures 27cm/10.755 in long x 14.8cm/5.75in wide so this set is perfect for all 7”-10”/ 17-25cm dolls! 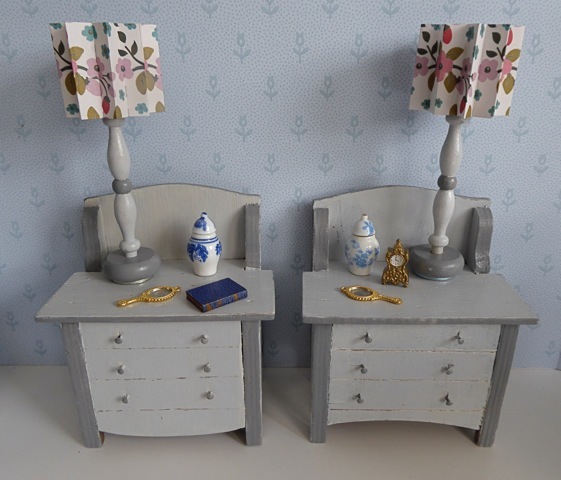 SIDE TABLES: Matching, handcrafted washstands with non-opening drawers but with lots of space on top to hold ceramic ginger jars, little “golden” mirrors, plus a book and clock. There’s also a (non working) handmade lamp on each, complete with pleated paper lampshade. WALLS: Covered in a delightful vintage wallpaper, which has been mounted on two pieces of 5mm thick A3 foam board. Each piece of foam board measures 42x29.5cm or 11 5/8 x16 3/8in. 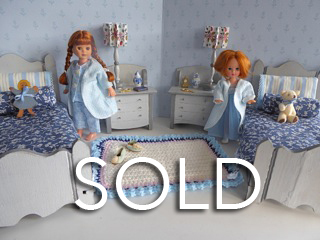 DOLLS: Chosen from our selection of vintage dolls – please see the DOLLS section of this website for a greater choice. The dolls shown here are an auburn-haired, Kripplebush Kids doll (on the left) – she is also available in a blonde- or brunette-haired version. She is wearing a vintage pyjama set, available on request. On the right is an auburn-haired GARDEN GAL doll, wearing a nightgown and dressing gown set, also available upon request. (We think they make wonderful sisters).